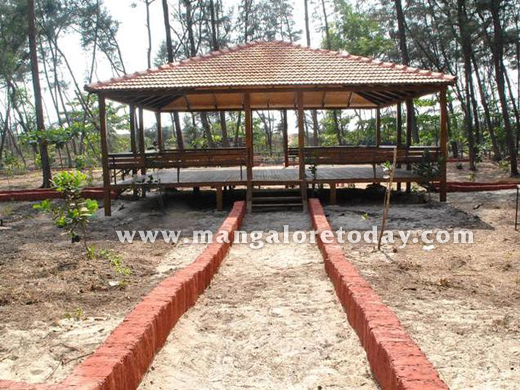 Mangaluru, March 24, 2016 : Mangaluru beach buffs, are set to cheer the ‘Tree Park’ developed by the Forest Department at Tannirbavi beachfront set for inauguration on March 26, Saturday. Deputy Conservator of Forests, Mangaluru, K.T. Hanumanthappa told media that the Minister for Forests, Environment and Ecology, B. Ramanath Rai, would inaugurate the park at 11.30 a.m. Spread over two parcels of land, nine acres of Gurupura river-front land and another 22.5 acres on the beachfront; the Tree Park has plant species from the Western Ghats as well as herbal plants. “The idea of a Tree Park is to spread awareness on the importance of green cover, development of lung space, conservation of biodiversity and also to promote love for nature and its creations. The concept is intertwined with a tinge of folk and cultural facets of the coastal areas with terra cotta motifs of Kambla, Yakshagana and Bhootada Kola,” said Mr. Hanumanthappa. The park will also have a children’s area, a cultural area, a food court, beachfront amenities and much more. The amenities include an information kiosk, beach volleyball court, and beachfront relaxation area with pergolas for those who want to stretch their visit beyond the Tree Park. “All structures, including the rest houses, interpretation centre etc., are built of wood; no concrete structure has been put up, keeping in mind the Coastal Regulation Zone norms,” he said. A managing committee will be set up for maintaining the park and the entry fee to the park will be reasonable, Hanumanthappa added. The Forest Department has spent nearly Rs. 2 crore on the project, which is being developed in all district headquarters as per the government directive.